Oisans is an unmissable destination for any self-respecting cyclist, whether amateur or professional! It’s worth coming just for the 21-switchback climb between Bourg d’Oisans and Alpe d’Huez. In summer, it is tackled by no fewer than 1000 cyclists every day. From Bourg d’Oisans you can reach the classic climbs such as Glandon, Croix de Fer , Galibier and the Telegraph, regular used in Le Tour De France. Additionally you can find lesser known mountain roads to villages such as Oulles, Ornon, Villard Notre Dame and Le Molard. 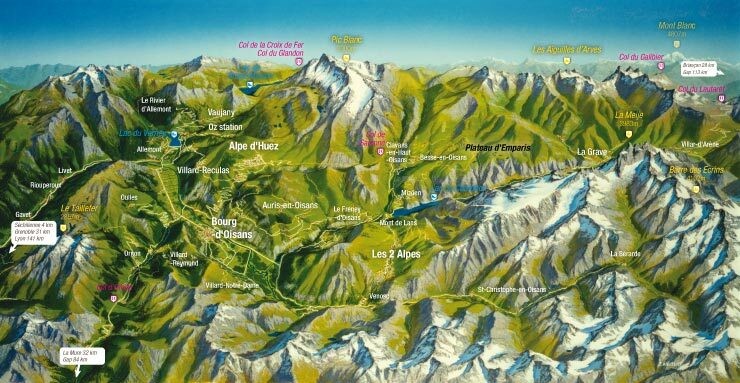 BikeOisans.com have created a comprehensive guide listing a great collection of rides in the region. You will find all the information required to help choose your rides such as, ride duration, difficulty level, elevation, routes and distance…..the rest is up to you! Check out the mountain passes currently open to cyclists! If you feel you need some cycle support during your stay to help with the longer routes, or someone to be on hand with extra clothing and food then let us know. We are happy to tailor make a support service to suit your needs.